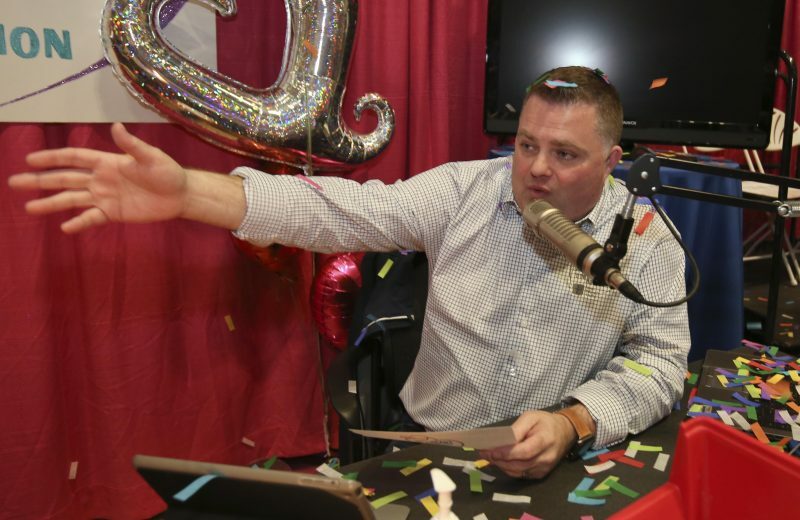 Confetti falls around 98.1 KDD radio host Keith Kennedy as he announces the amount of total donations during the 2018 “Have a Heart, Do Your Part” Radiothon — $657,405! 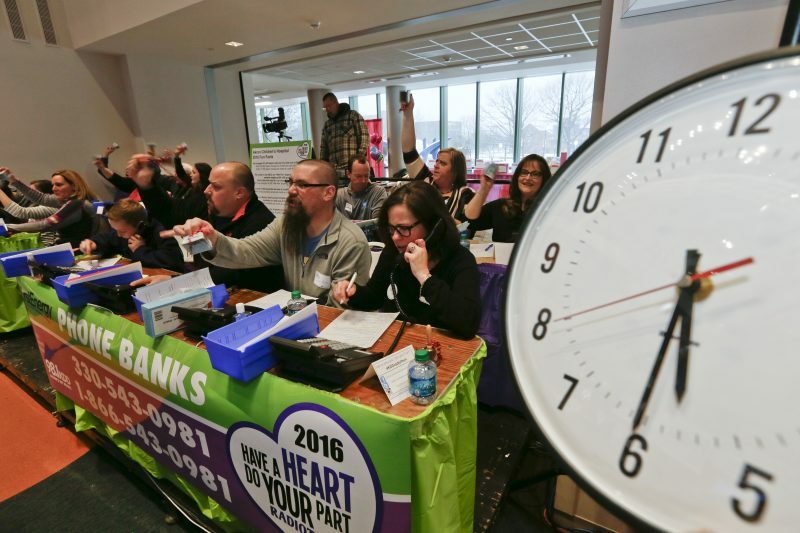 Keith Kennedy, longtime radio host and vice president of programming for iHeartMedia, is as excited to be a part of the 98.1 KDD 20th anniversary “Have a Heart, Do Your Part” Radiothon as he was when it first began in 2000. Even before he became the “official” on-air host in 2010, he was an integral part of brainstorming the “Have a Heart, Do Your Part” slogan and has produced all 20 radiothons. “Partnering with Akron Children’s was a natural fit for KDD because our radio station, like the hospital, is about serving families so it was a perfect marriage,” Kennedy said. Growing up in Orrville, Kennedy was a healthy kid who didn’t see the inside of a hospital much, but he was familiar with Akron Children’s because of a family member who had been a patient. “I had a cousin with cerebral palsy a few years younger than me who had several surgeries at Akron Children’s as a youth,” he said. Too young at the time to understand the significance of having a world-class children’s hospital in his own backyard, as a father, the concept isn’t lost on him now. 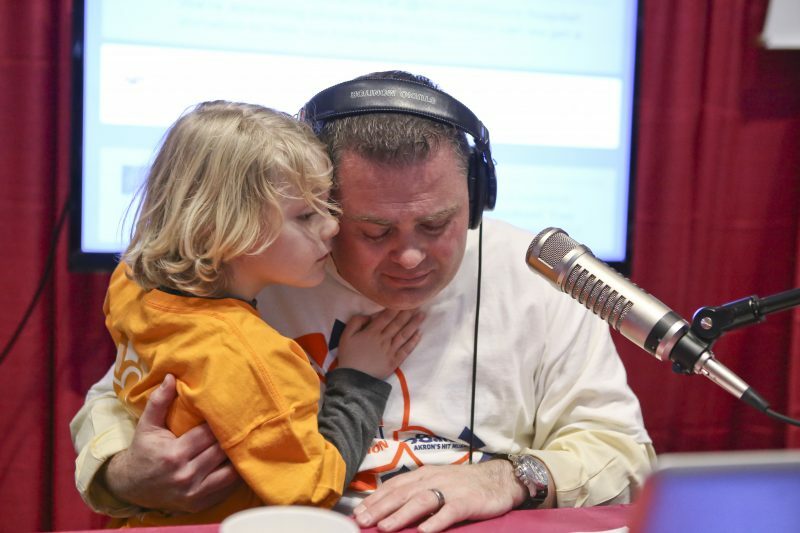 In 2015, Keith’s son Landon helped out in the hospital lobby during radiothon. Gearing up for radiothon’s 20th anniversary, Kennedy says the 3-day event is a labor of love for him. Kennedy says there are too many kids over the years for him to have a favorite, but he does enjoy getting to see some of the same ones from year to year. Spencer Beal and his parents tell their story to Keith on air in 2017. 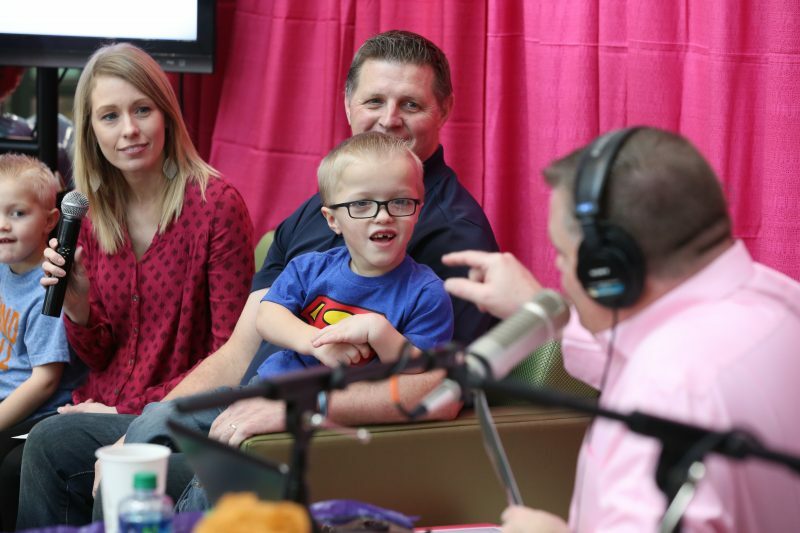 While he never sets a monetary goal for radiothon, he is proud of the fact that Akron’s radiothon is one of the top 5 most successful in the country. The phone bank is manned by volunteer groups and companies who want to give back. Here, they cheer on Keith’s cue for the live radio audience. Kennedy says individuals and companies often call in and offer to match donations made within a certain time period. Last year, radiothon raised $657,405, and the hope is the 20th anniversary can set new records. If you’d like to contribute to the “Have a Heart, Do Your Part” radiothon, visit akronchildrens.org/radiothon. Follow on social media with the hashtag #KDDRadiothon. 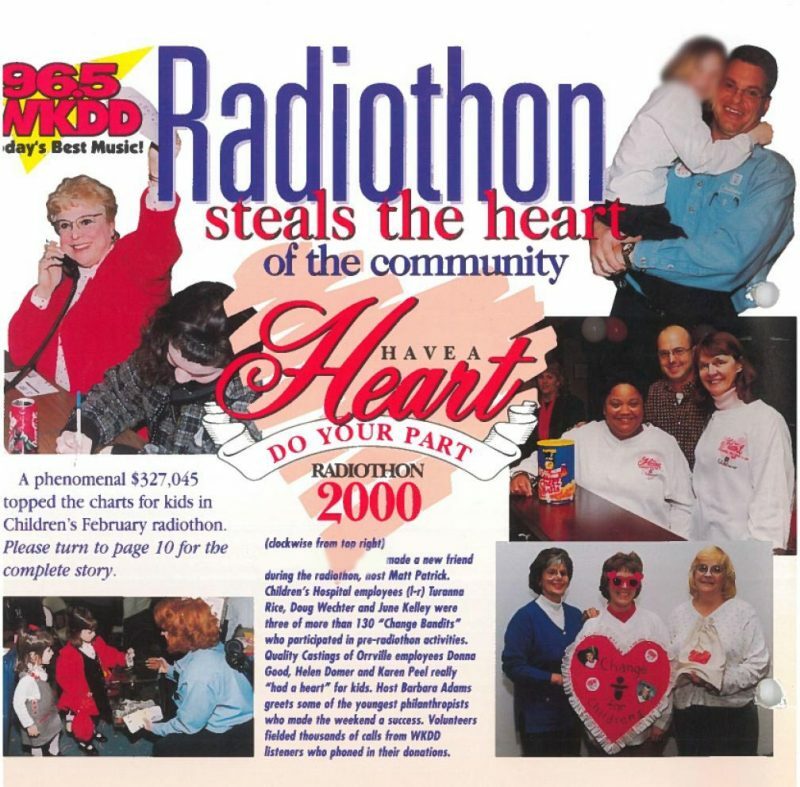 This “Progress” newsletter article from 2000 highlighted the first radiothon. Kathy Johnson is a northeast Ohio-based freelance writer, editor and public relations consultant with over 25 years of experience in the healthcare industry. She writes extensively for blogs, websites, newsletters and magazines. Since 1999, she has been the principal at New View Communications serving a variety of hospitals and healthcare-related clients.